The future of the LED lighting industry has arrived with nuLEDs SPICEbox™, the PoE Control Module that delivers the power and management capabilities to your LED fixtures. Each SPICEbox™ is a network device with a unique MAC address and IP address. SPICEboxes have multi-channel control for separate lighting loads, including color mixing. A SPICEbox™can serve as a sensor host for wall switches, PIR sensors, ambient light sensors, or other sensors. 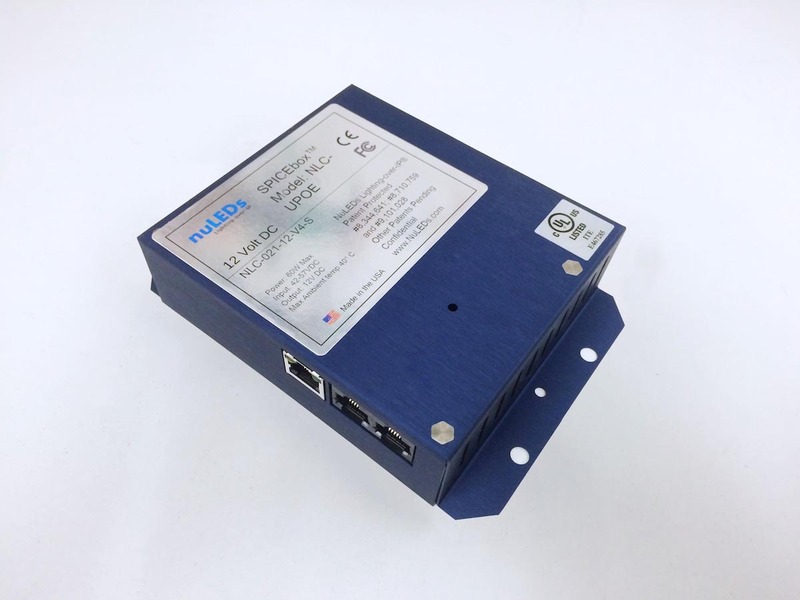 The SPICEbox™ is powered from the PoE switch through CAT5e or CAT6 cables, and provides up to 60Watts of 12-36VDC power to lighting fixtures over 2 or 4 wire connections. This makes the deployment of LED fixtures in a new installation or retrofit situation extremely flexible and adaptable. Without the need for conduits to carry solid copper cabling for high voltage power, the illumination of any environment can be delivered easily and efficiently. LED lighting uses significantly less energy than conventional lighting and with the SPICEbox™ PoE LED solution, the cost of ownership is even lower. When integrated with ambient light and/or motion detectors, using the optional sensor ports, energy use and efficiency can be maximized to provide the lowest operating cost possible. With a load capacity of 4 channels, the control module can provide RGBW or 4 channels of a single color to any lighting environment. Each channel can be controlled to provide customized lighting atmospheres to suit any situation. Whether you desire to have the mood of a room changed by adjusting the color temperature or you want to create a brighter environment, the ability is yours to change on the fly or automatically based on pre-set schedules. Control of your lighting environment has now moved beyond a simple on/off or dimmer switch with the SPICEbox™ control module. Lighting environments can now be managed and adjusted by integrated room sensors or through management software that provides the ability to change colors, brightness, color temperature, etc., from any PC. mobile devices, or an unmanned event. In addition to controlling the lighting atmosphere, the control software also provides the ability to run diagnostics on any device or on the entire system. Management of the lighting system is now interactive and an invaluable tool. With the application software, the control modules and associated devices transform the lighting system into a facility management tool that can be monitored, managed, and controlled to create the optimal lighting atmosphere for system users and facility occupants. Configuring your PoE LED lighting system is flexible and adaptable when deploying the SPICEbox™ control module. Utilizing CAT5e or CAT6 cabling, the control module can be installed anywhere a network drop can be provided. Combined with wall controllers, ambient light sensors, or occupancy sensors, the lighting system can be tailored for any user and managed for maximum system performance.